Above is the latest book jacket credited to British artist Matt Taylor, whose illustration for the 2011 Penguin paperback reprint of John le Carré’s Tinker, Tailor, Soldier, Spy won that edition top honors in The Rap Sheet’s 2012 Best Crime Novel Cover contest. 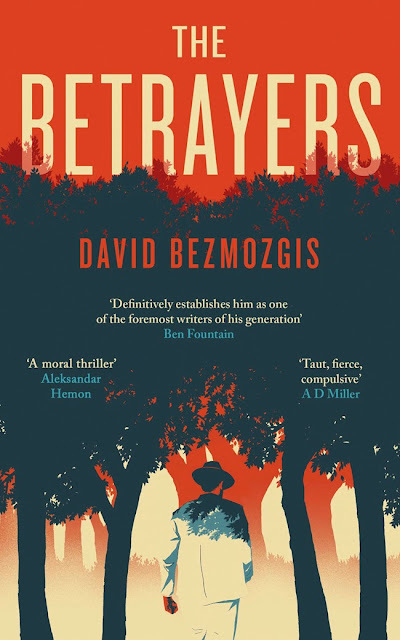 Haunting, moody, with lovely color contrasts and nice fade-away details at the bottom of the image, this front for the UK version of David Bezmozgis’ The Betrayers (Viking) is even more captivating in relation to Little, Brown’s considerably less inspired U.S. release of Bezmozgis’ novel. These incandescent pages give us one fraught, momentous day in the life of Baruch Kotler, a Soviet Jewish dissident who now finds himself a disgraced Israeli politician. When he refuses to back down from a contrary but principled stand regarding the settlements in the West Bank, his political opponents expose his affair with a mistress decades his junior, and the besieged couple escapes to Yalta, the faded Crimean resort of Kotler's youth. There, shockingly, Kotler comes face-to-face with the former friend whose denunciation sent him to the Gulag almost forty years earlier. In a whirling twenty-four hours, Kotler must face the ultimate reckoning, both with those who have betrayed him and with those whom he has betrayed, including a teenage daughter, a son facing his own moral dilemma in the Israeli army, and the wife who once campaigned to secure his freedom and stood by him through so much. Stubborn, wry, and self-knowing, Baruch Kotler is one of the great creations of contemporary fiction. An aging man grasping for a final passion, he is drawn inexorably into a crucible that is both personal and biblical in scope. I haven’t read Bezmozgis’ The Betrayers (which should not be confused with Donald Hamilton’s 1966 thriller of the same name), but Amazon’s write-up doesn’t make it sound like a crime or mystery novel. Which is too bad, because Taylor’s cover (with type design and art direction by Richard Bravery) might otherwise earn this work a place among the rivals for the 2014 Best Crime Novel Cover competition. Perhaps further investigation is needed.